Open Access Journals: Download Back Issues of Settler Colonial Studies for Free! …to establish settler colonial studies as a distinct field of scholarly research. Scholars and students will find and contribute to historically-oriented research and analyses covering contemporary issues. However, we also aim to present multidisciplinary and interdisciplinary research, involving areas like history, law, genocide studies, indigenous, colonial and postcolonial studies, anthropology, historical geography, economics, politics, sociology, international relations, political science, literary criticism, cultural and gender studies and philosophy. 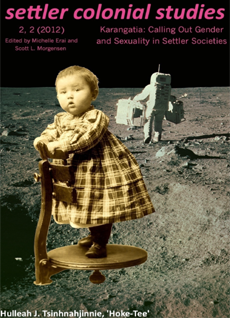 Back issues of Settler Colonial Studies are open access and feature articles by Andrea Smith, Qwo-Li Driskill and Scott Morgensen, who are all awesome.